Being Alkaline is not just about drinking water at a certain PH and then thinking it will solve your problems. Darnit, I know that is the trend lately. I find it so funny the trend also involves said Alkaline water in plastic jugs, even if they are BPA free. Improvements will be made of course, just because the body is simply being hydrated. Improvements will also be made because most people are drinking tap water or close to it water out of plastic jugs that is acidic and at a low PH. This blog isn't just about water, it is about becoming and staying alkaline. Water is where I see a lot of people go and think it will solve the problem. Choosing to EAT alkaline will solve the problem. Dis-ease thrives in an acidic environment. Candida and parasites love when our body is acidic and giving them a place to grow. It is like a broken record but start with leafy greens. Chlorophyll is alkaline. Taking in tons of leafy greens will cleanse the blood and allow us to become less acidic. We do want some acidness, but this will come in the form of nuts and seeds along with animal products if you choose to eat meat. We can shoot for an 80/20 balance. 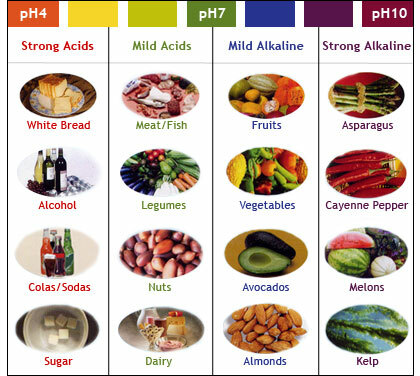 It is also helpful to only pair one acidic thing with your alkaline meal. For instance, the average plate is meat (acidic) carb (acidic) and salad or veggie side (alkaline). The goal should be protein and tons of alkaline veggies, that is it. Fruits and good fats are still in the moderately alkaline state, so having an avocado with a meal is fine. Remember to be mindful when you look at your plate, or even before you make your food. What does my body need? Is it serving to help fuel me or just to taste good. Ideally it is doing both for you.